[Sussex Living] Just days before the start of the London 2012 Olympic Games, some of the best riders in the world will be at Hickstead for the Longines Royal International Horse Show – the official show of the British Horse Society. The world’s top eight showjumping nations will arrive at the All England Jumping Course in West Sussex for the FEI Nations Cup™ of Great Britain. This flagship event – with a E200,000 prize fund – will be held on Friday 20 July, and following last year’s victory by the German team the home side will be doing their utmost to claim back the honours. Sunday’s finale class, the Longines King George V Gold Cup, is one of the most sought after international Grand Prix classes in the world. A win at the show will no doubt bolster a nation’s confidence and morale just before the Olympics, so expect to see one of the most competitive fields in Hickstead’s history. Olympic course builders Bob Ellis and Kelvin Bywater will also be creating the courses for Hickstead, giving riders a final chance to jump round their tracks just before the Games. The international classes start on Thursday 19 July, with the Amlin Plus Eventing Grand Prix. This class sees event riders and showjumpers go head to head round a course of coloured poles and fixed rustic fences. Last year, Gary Parsonage made history by winning the class for the fourth time – will a showjumper take the honours this time? Saturday is a very special day at Hickstead. Not only do we have the Templant Events Queen Elizabeth II Cup, the pinnacle of national grand prix classes, but it’s also Ladies’ Day at Hickstead, held in support of Variety, the Children’s Charity. Ten of the most fashionably dressed visitors will be chosen by Hickstead’s team of selectors, and invited into the International Arena for the final judging. 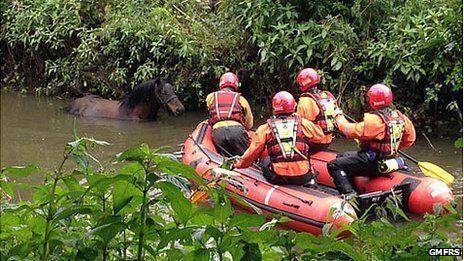 Read the full story at Sussex Living…..
[BBC News] Firefighters who rescued a horse from a flooded Greater Manchester river have said the animal was “safe and well”. Crews were called to Martland Park, Wigan, on Tuesday morning after receiving reports of a horse being unable to get out of the River Douglas. 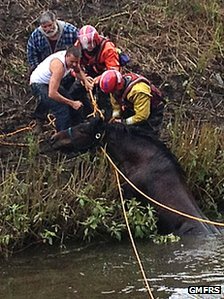 Water rescue teams worked for three hours with ropes and an inflated fire hose to rescue 16-year-old mare Molly. Station manager Ben Levy said the rescue was “difficult” due to “the heavy rain we’ve had recently”. He said members of the Royal Society for the Prevention of Cruelty to Animals (RSPCA) had initially attempted to rescue the horse, but had been unsuccessful, so had called Greater Manchester Fire and Rescue Service for help. Two specialist water rescue crews attended the incident and used the hose “to create a barrier to guide Molly to a safe area before getting strops round her,” he said. He added the mare had been moved down the river to a “suitable spot” before being walked out of the water. “It took three hours in total to rescue Molly from the river [which] was quite deep because it was flooded due to the heavy rain we’ve had recently,” he said. [Telegraph] Given all the criticism about limited space, expense, absence of legacy, damage and lock-out of local users, Greenwich Park’s most redeeming feature could also be its most unexpected: the ability to run an Olympic cross-country when other major venues have sunk under mud. Gatcombe Park usually welcomes unseasonal rain to take the sting out of its quick-drying parkland but even this has fallen victim to waterlogging. Seventy days’ worth of fixtures have been rained-off since March. It has cost national governing body British Eventing (BE) £750,000 in rider-entry abandonment fees; it may now extend the national season to November to catch up. There are huge losses for small events that operate on a shoestring anyway and some retailers look for half their annual turnover at headline fixtures. The British eventing team might have looked slightly different if Badminton had run and given a prodigy the opportunity to impress. Edwards was venue manager at Sydney 2000, a permanent build. Greenwich has presented different challenges but he says he is “happy with progress”. He said: “I have seen no…..
[The Telegraph] Olga White, owner of show jumper Peter Charles’s London Olympic ride Murka’s Vindicat, has bought a cloned yearling of 1988 Olympic silver medallist Gem Twist, regarded by many as the best equine physical specimen the sport has ever seen. “It is absolutely unbelievable that we have a perfectly entire clone of Gem Twist,” said White. “For my rider, Peter Charles, this is a dream come true. A few years ago we would not even have dreamed of it. Read the original story at The Telgraph…..